At Baebies, we recruit interns who work on real business cases. Our interns don’t file papers or make coffee runs. They assist in research and development to help more babies have a healthy start. 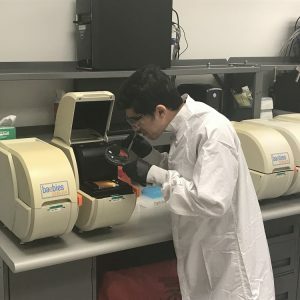 This summer we have 8 interns who are actively working on the expansion of our assay pipeline and on new product FINDER (currently under development). Most of our interns have degrees from nearby North Carolina State University and Duke University, but we also have current Masters students from the University of Missouri-Columbia and the University of Texas at Dallas. These “Elite Eight” also have a range of degrees, from a recent undergraduate in engineering to a Ph.D. in microbiology. From left: Yuqi Huang, Becky Kitchener, Ph.D., Sriram Gaddamanugu, Srujan Bhagwat, Daniel Wu, Dhruv Patel, Alicia Hoagenson. Not pictured: Caroline Wright. “I have enjoyed working in Baebies’ fast-paced, collaborative, and innovative environment, and am excited to help bring a product to market which can profoundly improve the standard of healthcare for newborns,” commented Sriram Gaddamanugu who is working on the FINDER product. Our interns have made an impact at Baebies and will continue to change the world as their careers progress. Our diverse group includes an MBA candidate, an aspiring dentist, and a future tissue engineer to name a few. Baebies internships are posted in the usual spots: on our website, external job sites, social media, and university career services portals. But half of our current interns found out about the opportunity through personal connections to Baebies employees. If you are interested in working at Baebies, we encourage you to reach out to our employees for referrals. Check out our internship and career opportunities. Follow us on LinkedIn and subscribe to BaebieTalk newsletter to stay updated.